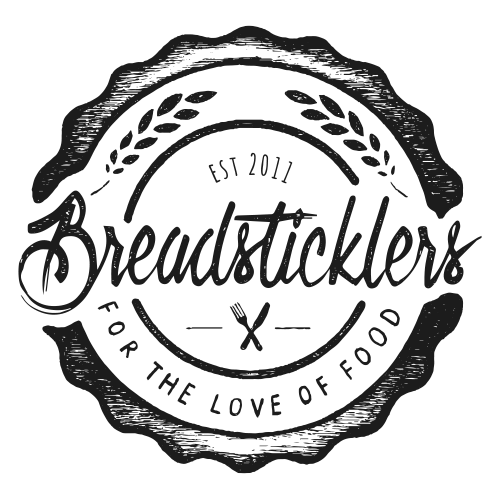 If you haven’t booked your Christmas lunch or dinner yet with friends or colleagues you are severely lagging behind, I know people who started booking them January this year for December 2016. 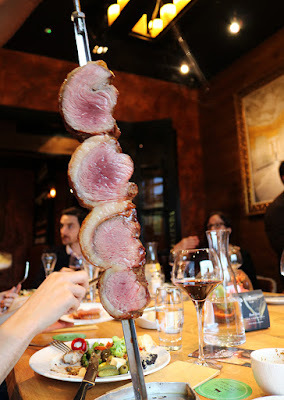 If you’re still undecided on where to go I offer to you an alternative, Fazenda, Christmas style. Fazenda probably isn’t one of the first places that spring to mind when you think of Christmas, skewered steaks and Brazilian food isn’t particularly festive (in the UK). If you’re going to a few Christmas ‘do’s’ this year (you lucky thing) you might get a little bored of Turkey roast dinners and bland Christmas puddings, so why not sink your teeth in to some steak instead? Fazenda isn’t completely bah humbug option when it comes to festive lunches as they have added a little Christmas sparkle to their menus throughout December including turkey treats and skewered pigs in blankets (because Christmas isn’t Christmas without a portion of processed pig wrapped in up in a layer of it's own belly). 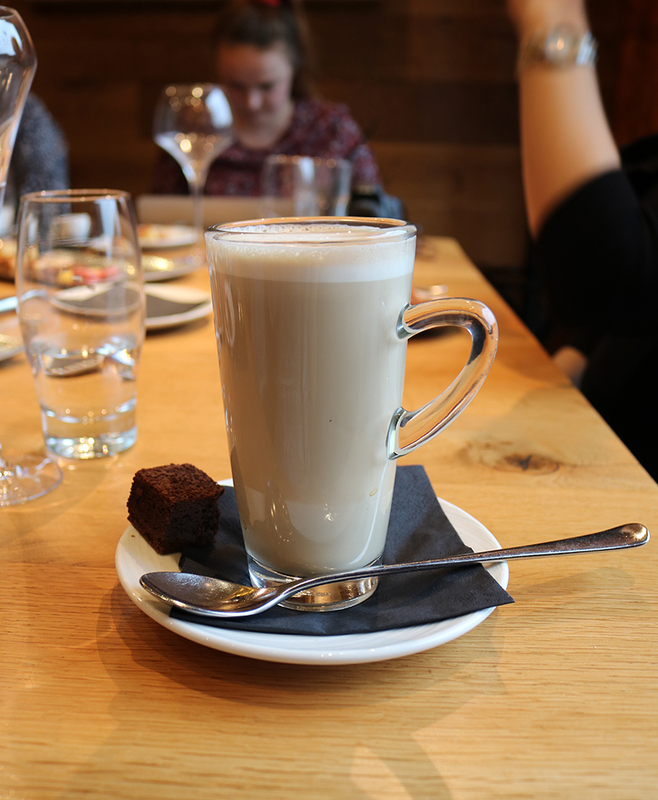 I was invited to Fazenda to try their festive features and also experience Fazenda for the first time. I know it’s shocking that I have never been before but rest assured it wasn’t for the want of trying. 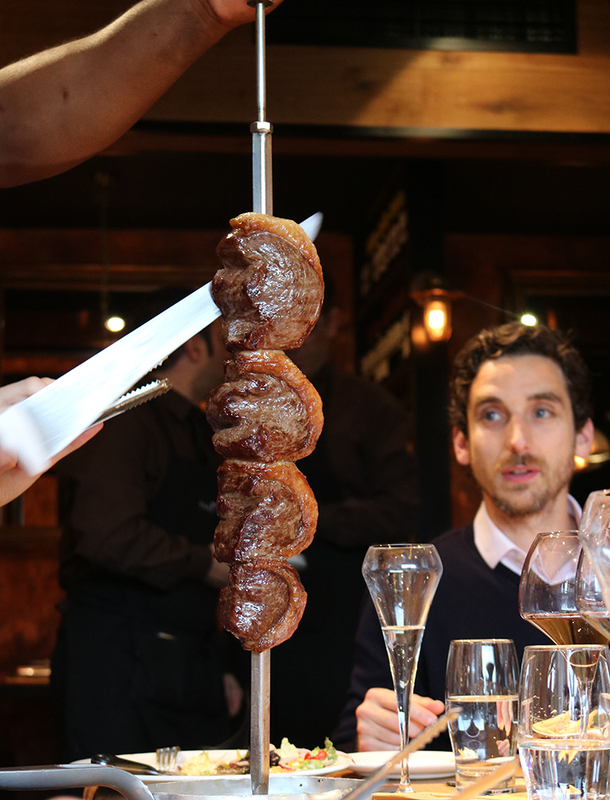 Unfortunately I just haven’t been organised enough for Fazenda’s busy schedule and each time I’ve tried to book (for special occasions as standard dinner menus come in around £40 a head before booze) I’ve been knocked back and had to go elsewhere. 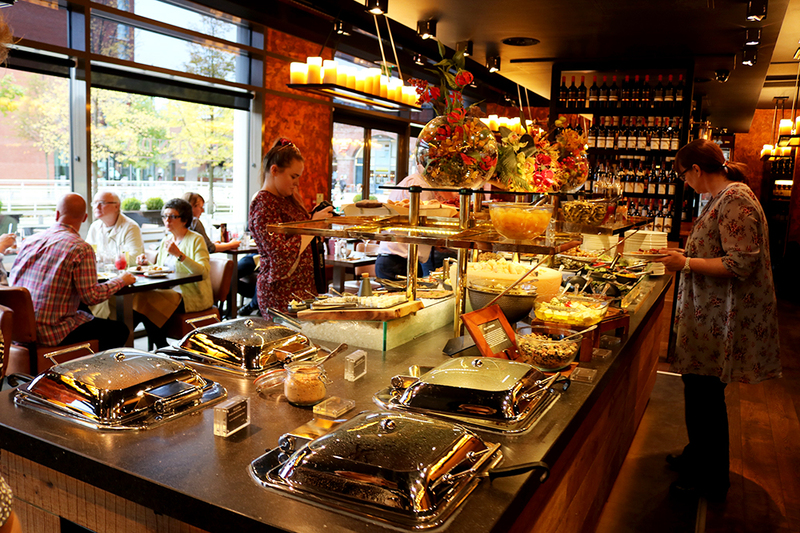 The salad bar is immense, no seriously! Fazenda was first the first Brazilian grill I had ever heard of, in its essence it is a basically an all you can eat steak restaurant. The meat is served to you at your table from skewers and you are given green and red cards which you flip to indicate whether you are ready to go for more meat or stop because your stomach is about to explode. Over the years there seem to have been a fair few more of these types of restaurants pop up, whether they were in other cities first I don’t know but Fazenda was definitely the first in to my food conscious. 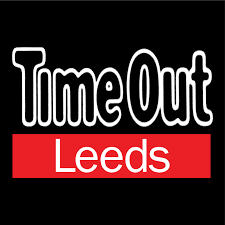 They have proved themselves popular in the city, not only with being almost impossible to book last minute on a weekend, but they have also expanded further in physical size with an extension on their original restaurant in Leeds and they now have a couple more places outside of Leeds too. 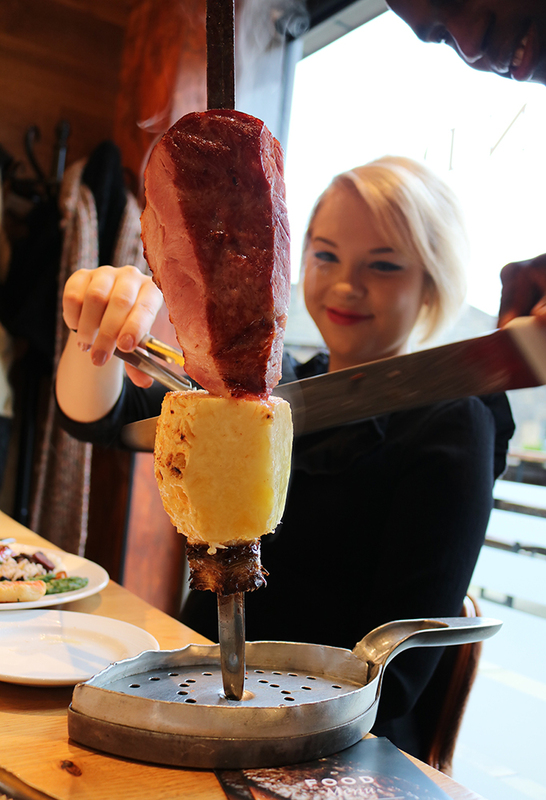 If you have ever spoken to anyone about Fazenda they will tell you how good the salad bar is and tales of failing themselves (and their bellies) by overindulging on the salad and being too full to devour all the delicious meat that is on offer. Pffft you may think (as did I), a salad bar, I laugh in the face of lettuce. You will be wrong to scorn (as was I) as this salad bar is no ordinary salad bar. Oh no. I can barely call it a salad bar. 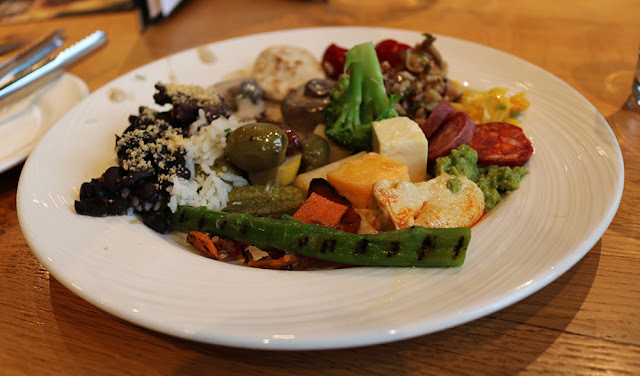 It is a boat of Brazilian dreams, if you have a Brazilian friend (as I do) and they have cooked you some of their home dishes you are likely to find it in this 'so-called' salad bar. There is not just lettuce, tomatoes and cucumber here, there is rice dishes, chorizo bean stews, cured meats, cheeses, olives and so so much more. 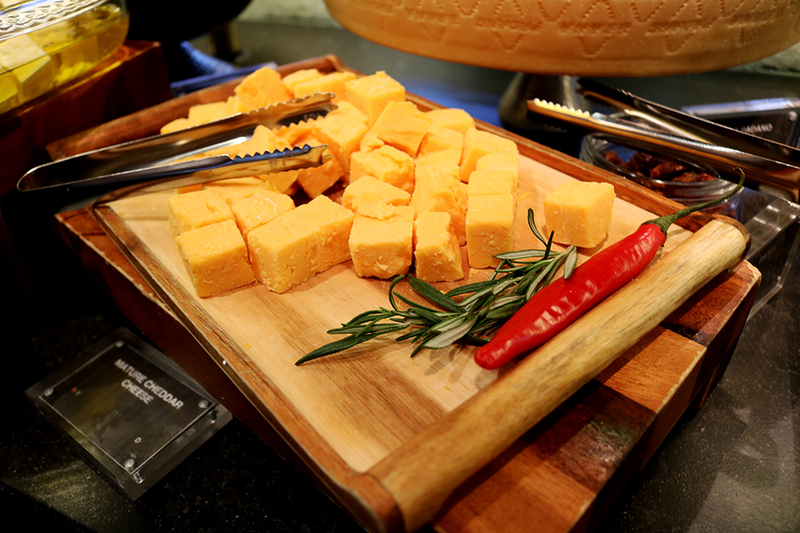 It’s hard not to indulge. 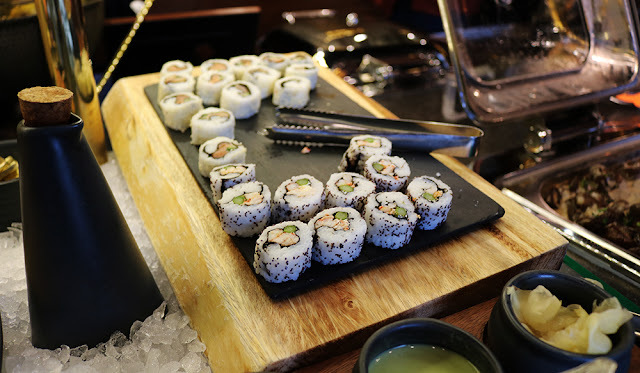 I tried to hold myself back by choosing the smallest portions of everything I fancied, but then there was so much I fancied that my plate was full by the time I got back to our table. Once you’re back at your table with your little card turn to green it’s time for the meat to be brought out to you. You can’t order it to preference but dependent on how far they are in to carving on the skewer it will be from around medium to well done to medium rare. 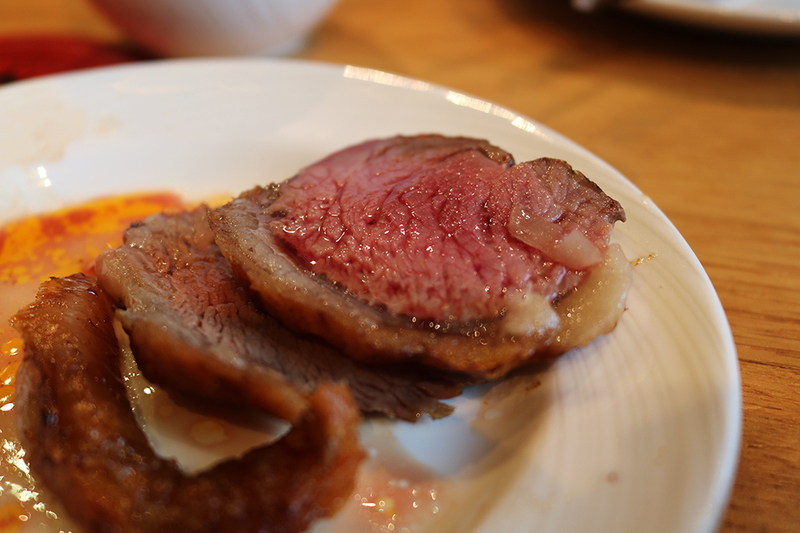 The picture below demonstrates a third shaving of meat and it's looking pretty rare in the thicker sections. There are so many cuts of beef presented it’s almost near impossible to keep up with which is which, however after a while of mixing your meats things start to taste the same (or at least they do to me). 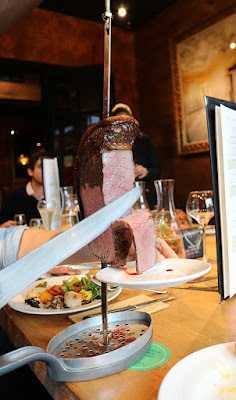 Some of the meats we tried were Picanha (the signature cut), Alcatra (rump), Tritip (sirloin). This was served alongside cuts of lamb (one of D's favourites), pork belly (absolutely delicious), gammon and pineapple, chicken thighs and turkey. I was less impressed by the chicken thighs, although cooked well it is still just chicken at the end of the day and it was a waste of stomach space for the more satisfying steak. The same applied for turkey, which if I'm honest I only tried as this was a Christmas themed lunch, I will normally avoid turkey unless it’s leftover from the day before and presented to me in wholemeal bread with decent quality mayo and ground peppercorns. The pigs in blankets were substantial in size far bigger than some of the piddley versions I’ve been served in pubs, I suspect the reason for their size at Fazenda is because it would be difficult to skewer a tiny wiener. 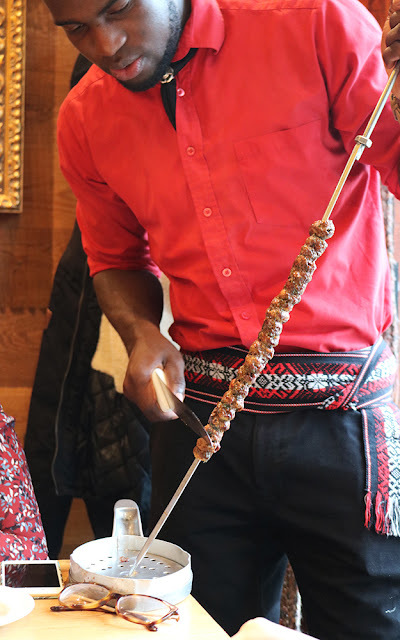 A lot Fazenda veterans have also raved about their chicken hearts (in addition to the salad bar), these aren't usually on the lunch menu but as a few of us were yet to try them they made us an exception. In all honesty offal has never really tickled my fancy but I am always willing to try something new, they weren't the best thing I have tasted to date but they weren't awful either (although D would tell you a different tale) and I found them much more digestible with a marinating of chimichurri (which is delicious by the way). Despite having a plate full of salad with a side of continuous meat (I was beginning to feel like the naughty child in the magic porridge pot tale who didn’t know how to make the food stop coming, apart from I did, I’m just greedy and didn’t want it to stop) I still managed to sample the fries and the Brazilian cheese balls laid out on the table, the chips were bang on and perfect to soak up the meaty juices on my plate. The cheese balls, I’m sorry but they didn’t quite live up to my friend Josh’s (Josh you promised you’d make me some to put in my freezer for emergencies, it’s here on my blog for all to see now too so you can't back out!). Once again greed took over and when we were offered dessert and coffees, I couldn’t help myself responding “yes please!”. 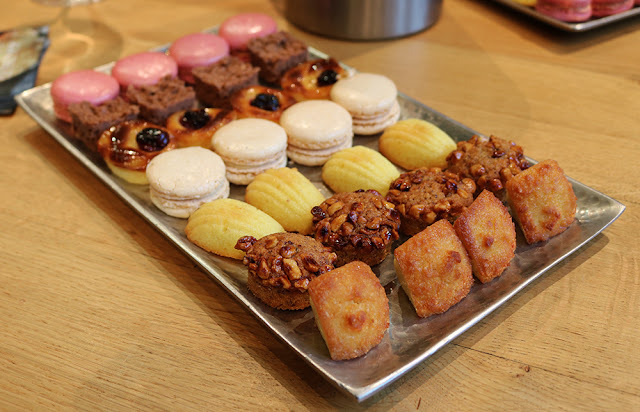 Thankfully desserts come in miniature size, with a range of macarons, posh corn flake squares, madeleines and other lovely delicacies (yes I forgot their names). I couldn’t complain about any of them but it was definitely an extra indulgence and not a ‘need to eat' after such a hearty meal. We met a few of the people behind Fazenda’s sales and marketing teams although it is their job to make our visit enjoyable this time it really felt like I was in the company of friends. As cheesy as that sounds if you were there to witness D’s conversation with their sales director in which they hatched a plan to solve all of Leeds’ transport woes (not an easy challenge) you would understand completely what I mean. Whether you chose to go for Christmas or not, if you haven't been to Fazenda yet I would definitely recommend a visit. 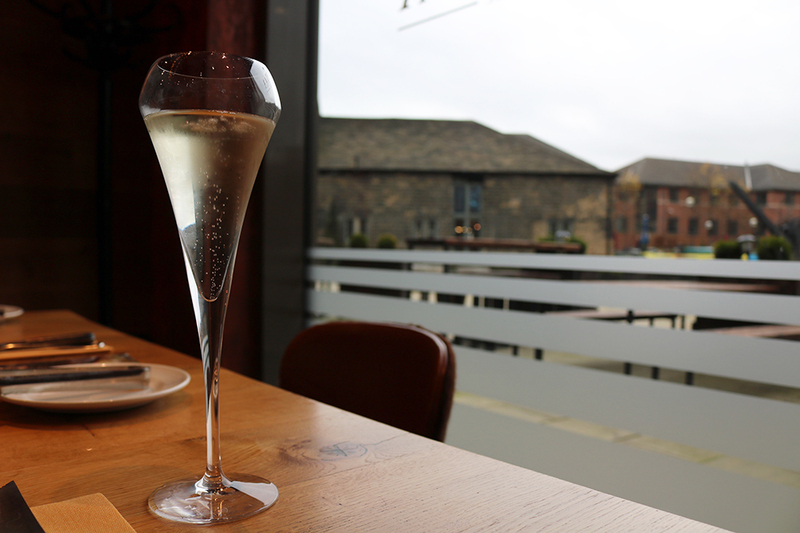 Friday lunch times are much quieter than evening dinner times (you won't fail to book a table post December) and it's cheaper too! Win. Win.